So now to The Ring of Solomon. The book that I re-read the entire Bartimaeus series thus far to prepare for. I remember this book coming out with surprisingly little fanfare considering how well the series before had sold. Admittedly, by the time it came out, I was in my first year of university, so my attention may well have been a little on the diverted side. But now that I've finally gotten to it, I can finally find out if the prequel is worthy of the rest of the series. 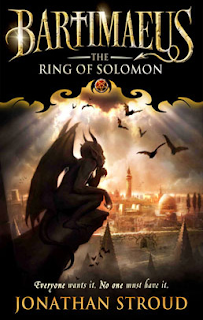 The Ring of Solomon sees Bartimaeus serving a master in Solomon's Jerusalem. Having just devoured his last master, he finds himself facing enslavement by an even harsher magician as punishment. His exploits proceed to get him and his master into even deeper trouble, straining at their already frayed relationship. Elsewhere, Asmira is brought before her ruler, the Queen of Sheba, and charged with killing King Solomon and stealing his ring of power, following a violent demand for exorbitant taxes. Determined to live up to her mother's prestigious reputation, she sets off to Jerusalem with little more than a few knives and a prayer. I sorely regret not reading this book earlier. It is everything that I loved about reading the series for the first time. Certainly it's been a long time since I nearly giggle-snorted on the bus. Bartimaeus was fantastic as usual, although it's obvious that this is a younger, slightly less jaded version of himself. It's an interesting change, as he still has a weird affinity for selfless/unwittingly suicidal humans despite Ptolemy being a far-off prospect. Speaking of Ptolemy, there's an interesting evil parallel with his relationship to Bartimaeus in the characters of the magician Khaba and his loyal marid Ammet. What was touching and poignant between Bartimaeus and Ptolemy becomes infinitely more sinister and unhealthily feeling like blind devotion on Ammet's part rather than an equal partnership. There were a couple of things that I wasn't really expecting when I started reading The Ring of Solomon. Firstly, I didn't realise just how good a starting place this would be for new readers of Bartimaeus. On the surface, this seems like a stupid thing to be surprised about, but I've been burned by stand-alone spin-offs before. But this struck a really nice balance between providing enough information for new readers, whilst not bogging down the narrative with background that long-time readers already know. Since the setting is so far removed from the main trilogy, there's no knowledge needed about the main plot, so it's perfect for those who want to try out the series without necessarily committing to a trilogy that they're unsure about. Secondly, it made me realise just how much I want to see more from Bartimaeus, even if it's in the form of stand-alone stories. I hadn't realised just how much I missed reading new adventures for this character. It's unlikely that Jonathan Stroud is reading this, but if he is, then this part is addressed specifically to him. If you ever have any more ideas for Bartimaeus, please write them. If they could involve his time working for Nefertiti then that would be great, but honestly, I would probably read anything at this point.